We are your friendly neighboorhood store. 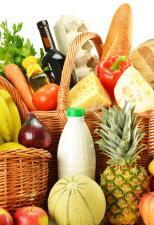 We are here to provide you with a quality retail grocery service. Satisfaction, friendliness and prompt service are all guarantees our customers can enjoy. We provide a clean and healthy atmosphere in which to shop. We take pride in our community and appreciate your business. We know that you have other options for your food purchases and we are working hard each day to continue to earn your business. Our meat department and our produce department are known for some of the best quality and prices in the area. So give us a try you will not be dissappointed!